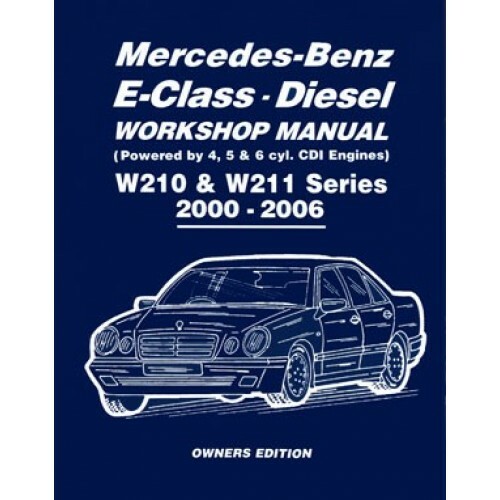 This Owners Edition Workshop Manual covers the Mercedes-Benz E Class Diesel W210 & W211 Series from 2000 to 2006, fitted with the 2.2, 2.7, 3.2 Litre, 611, 612, 613 with four, five & six cylinder CDI engine. It has been specially written for the practical owner who wants to maintain a vehicle in first-class condition and carry out the bulk of his or her own servicing and repairs. Comprehensive step-by-step instructions are provided for service and overhaul operations to guide the reader through what might otherwise be unfamiliar and complicated tasks. Numerous drawings are included to amplify the text. With 232 pages, well illustrated. SB.